Baby showers, cupcakes and cake go hand-in-hand! 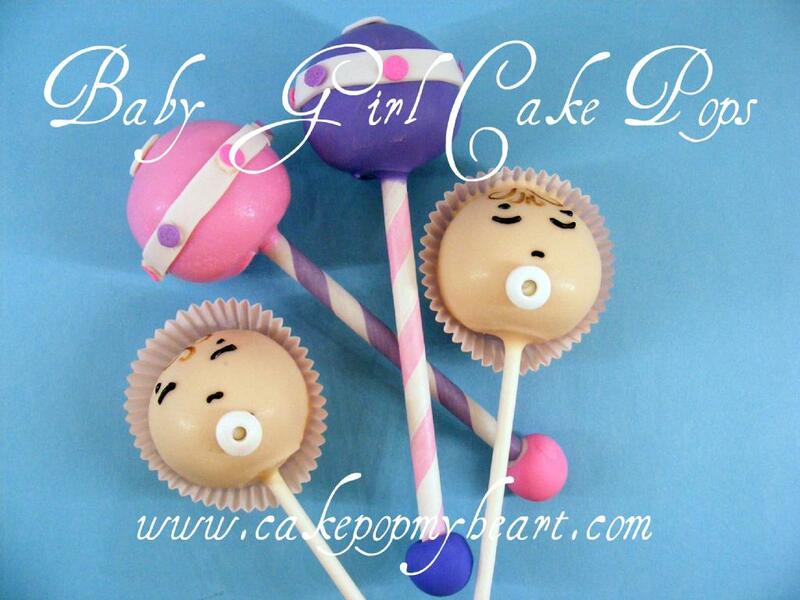 The latest craze for birthdays, weddings and baby showers are cake pops! A cake pop is a cake that has been baked and let cooled. Then crumbled very fine. Icing is added and mixed until the texture is creamy and dough like. Then it is rolled into a ball or any shape that is desired. It is then dipped into a decadant chocolate and decorated just right! Cake pops can be made into just about any shape or figure! That is why they are always the hit of any party! They can be colored, shaped and decorated to match ANY event just perfectly to add that extra special touch. 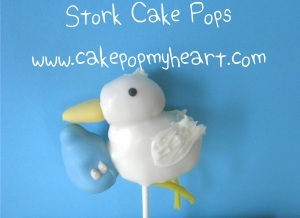 To make you event "POP" and stand out even more in your guests mind, add some custom cake pops. People will be talking about your party for months afterwards!!! Believe me! 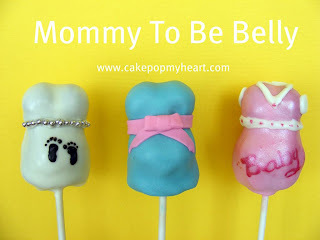 Gender reveal cakes pops are perfect for baby showers, as they hide the secret to the gender of the baby inside! When guests bite into the cake pop, the cake will be pink or blue - what a fun surprise! Cake Pop My Heart creates some of the most adorable and creative cake pops that I have ever seen. They are amazing! Each one is hand made and dipped with love, which we all know makes them taste better! 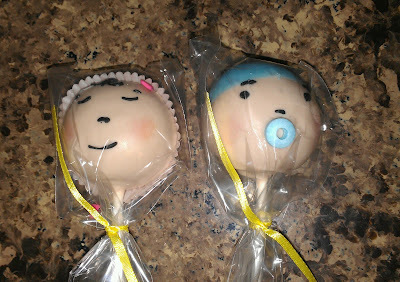 I will admit that when my baby themed cake pops arrived, I quickly opened the box and couldn't believe what I saw. They were all adorable! So unique and creative, so cute that I didn't want to eat them! Of course, I had to try them! My kids couldn't wait to sink their teeth into one, their only problem was choosing which one they wanted to try first. My daughter kept saying... "But Mom, they are all SO cute. I can't choose!" Finally, we all made our choices and were ready to take our first bite. Let me just say that they were delicious! The cake was moist, the frosting the perfect sweetness. I couldn't stop with just one, I had to eat another! Each cake pop was as delicious as it was adorable! We sampled a variety of cake flavors and each one was mouth-watering! Every Cake Pop My Heart cake pop is individually wrapped in a clear plastic bag and tied with a coordinating ribbon. Colors can be changed for boy or girl, or done in neutral colors and the cake inside be colored blue or pink for the gender reveal party! Whether you're hosting a baby shower, wedding, birthday party, or other special party or event, Cake Pop My Heart has the perfect cake pop for your celebration. This giveaway will end July 25th at Midnight EST. Disclaimer: I received a dozen baby themed cake pops from Cake pop My Heart for the purpose of writing a review and hosting a giveaway. Regardless, I only recommend products or services I use personally and/or believe will be a good fit for my readers. The views and opinions expressed on this blog are purely my own. Results may vary. No monetary compensation was received. 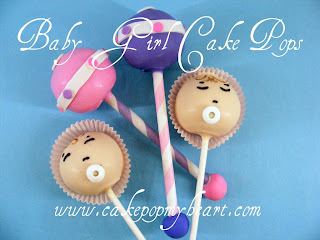 I like the Baby Cake Pops, too cute! My favorite is the Boston Terrier! I like the Flower Pots & the Princess ones.Thanks for the cute giveaway! I love the Barn Yard Pals. I like Cherry Blossom Cake Pops. I like the Hawaiian Luau Themed Cake Pops. awe! Love the baby ones :-) as i am pregnant! love the ladybugs and daisy ones...would be even cuter with a pink background. I like the Apples and Worms Cake Pops!